Sister Donna Marie Tahaney, 80, died Saturday, February 6, 2016, at the Motherhouse of the Sisters of St. Joseph in Baden in her 63rd year as a member of the Congregation. The daughter of the late John and Marion McDermott Tahaney, Sister entered the Congregation from Holy Rosary Parish, Pittsburgh. 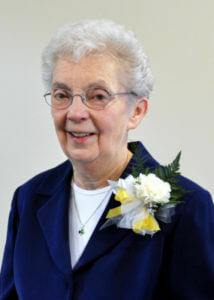 From 1956-1968, she taught at five schools in the Diocese of Pittsburgh, including Nativity School, North Side, and St. Joseph School, New Brighton, where she also was a principal. From 1968-77, Sister Donna Marie ministered as Director of Novices and then served 16 consecutive years in leadership as a Council Member and Assistant Superior General. In 1993, Sister Donna Marie became the first Executive Director of Girls Hope, a ministry that she was instrumental in founding. When her tenure ended in 2006, she continued to publicly advocate for the organization and nurture the college students and graduates of the program. Sister most recently served as Retreat Director for St. Joseph Spirituality Center. Sister Donna Marie is survived by her sister, Kathleen Mausteller of Allison Park, Pa., nieces and nephews, grandnieces and grandnephews, and the Sisters of St. Joseph of Baden. Friends will be received Monday from 1- 8 p.m. and Tuesday from 11 a.m. – 3:30 p.m. at the Motherhouse of the Sisters of St. Joseph. Prayer Vigil will be Monday at 6 p.m. at the Motherhouse. Mass of Christian Burial will be offered Tuesday at 4:00 p.m. Burial will follow in the Sisters’ Cemetery on the Motherhouse grounds. Donations in the name of Sister Donna Marie may be sent to the Sisters of St. Joseph Memorial Fund, St. Joseph Convent, 1020 State St., Baden, PA 15005, or Girls Hope of Pittsburgh, 1005 Beaver Grade Road, Suite 103, Coraopolis, PA 15108. Make a donation in memory of Sister Donna Marie.